Scientists with the Harvard-Smithsonian Center for Astrophysics (CfA) will unveil the latest discovery in the search for Earth-like planet outside our own solar system on Wednesday (Feb. 6), and you can watch the announcement live online. A press conference at the center will begin at 11 a.m. EST (1600 GMT) and be webcast online to unveil "new research on the prevalence of exoplanets orbiting red dwarf stars and the implications for the proximity of Earth-like worlds," CfA officials said in an announcement. The Harvard-Smithsonian Center for Astrophysics is based in Cambridge, Mass., and combines the science resources of the Harvard College Observatory and the Smithsonian Astrophysical Observatory, according to a center description. About 300 scientists currently work together on joint projects at the center. NASA's Kepler spacecraft has been seeking out new alien planets since its launch in 2009. The space telescope stares unblinking at a single part of the sky and records dips in starlight, an indication of a planet orbiting a faraway star. 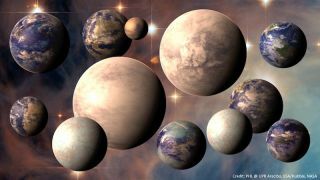 To date, NASA's Kepler mission has found evidence of about 2,740 candidate alien planets, with 105 of those worlds confirmed by follow-up observations. Visit SPACE.com on Wednesday at 11 a.m. EST (1600 GMT) to see the exoplanet news from the Harvard-Smithsonian Center for Astrophysics.